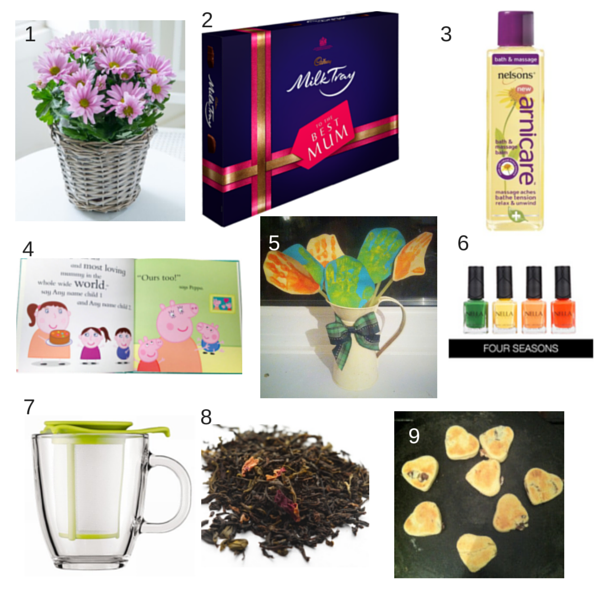 Earlier in the week I shared with you my Ultimate Mother’s Day Gift Guide. Now I promised I would provide you with a selection of more reasonably priced gifts. This post is filled with some lovely items that would still melt any mother’s heart but wouldn’t melt your bank card in the process! 1. Flowers. Unless your mum is allergic you really can’t go wrong with some pretty flowers. This pretty little basket of Chrysanthemums is just beautiful and just creeps into this gift guide at £14.99 delivered straight to your door. 2. Good old Cadbury Milk Tray, the last minute gift saviour of many a husband and son over the years. This year Cadbury has released this limited Edition Mother’s Day Box. It is a massive (600g) box for £12.99 and will keep any mum happily munching choccies, oh, for at least two evenings I’d say! 3. Pampering is the name of the game on Mother’s Day and this Arnicare Bath and Massage Bar, which is available at Boots, is a two in one product. Use it straight on your skin as a massage oil or pour under running water to create a sweet smelling milky bath. I have tried this and the Grapefruit and Lavender essential oils really do relax you and help you unwind. 5. Create a handprint bouquet. These particular ‘flowers’ have been on my shelf since the twins were almost two, what other bouquet would look this good after 12 years? They are super simple to make, just some paper, straws and paint (plus some cute little hands), I’ll be sharing a step by step guide with you in a few days. 6. These Nella Milano nail varnishes might be a little pricey for some at £8.95 a bottle but believe me, they are worth every penny. I normally struggle to find a colour I really like and then manage to chip them within 24 hours, but these are not only available in a vast array colours they are quite hard wearing too. 7, 8, 9. This Bodum mug and tea infuser set is only £8.99 and would brew a fantastic cuppa for one when paired up with this Afternoon Loose Tea for £5 per 100g. Now I may be slightly bias here but nothing goes better with a cup of tea than some freshly made Welsh Cakes. I will be sharing my favourite recipe next week so I’ll be sure to let you all know. Do any of these Mother’s Day gifts really take your fancy here? What else would you add?